Mix tuna with relish and mayo. Spoon onto lettuce leaf. Now here is the fun part- place one slice of provolone cheese on small place in microwave for 15 seconds. 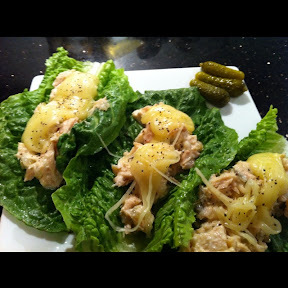 Using a folk add melted cheese to lettuce wraps! Sprinkle some pepper and that's a wrap.